There are many words in the English language that could be used to describe me. Quirky is a good one. Efficient would be another. A word you won't find on that list is stylish. No, I've never cared much about the latest trends. The worst thing of which you could accuse me regarding those is that I usually eventually do follow them, just a few months years too late. Good news--you, too, can be stylish, with the help of Shabby Apple! One lucky commenter will win her (or his...) very own dress! Just take a moment to peruse their lovely and fashionable dresses--you'll find everything from little black dresses to fun and flirty frocks. The winner has his or her pick (no exchanges, please)! *There's a 10% off coupon that all of you can use. Just enter "asoutherngrace10off" at checkout. The coupon will be active for 30 days. *This giveaway is open to US residents. *Comments will be open from today until next Friday, March 2nd. I'll contact the winner shortly thereafter, so be sure to leave me a way to contact you. Good luck! Melt the butter in a large saucepan. Add the sugar and bring to a boil. Add the dates and cook 5 minutes, or until the dates are cooked down. Cool a bit, then add the eggs slowly. Boil for 2 minutes. Remove from the heat and stir in the cereal until coated. Cool until able to handle and then form balls, roll them in coconut, and cool them completely on wax paper. Awww, I'm not eligible, boo! That dress is so gorgeous. Please wear it soon. You never need a reason for a dress :) I admit to being highly unstylish, but I do love a good dress. I love Shabby Apple!!! A trend here?? Let's see I'm surrounded by 14 years olds all day long, my life is one big trend. Um...super skinny jeans, that I am sure cuts off all their circulation! What a fantastic giveaway! I'm not one to necessarily pay attention to style trends, but it seems as though most Bostonians are rather relaxed when it comes to clothes. I've been eyeballing these forever. Now that you made them, I can approve! What an amazing giveaway! I am nuts about paisley and floral fabrics. When they're not in vogue I search them out at thrift stores. I love Shabby Apple's beautiful prints. I like your dessert, anything with dates and I eat it. We have a lot of brightly colored skinnies with boots, and loose, flowy tops around here. Or belted button up shirts. Cardigans are pretty popular too. I love Shabby Apple dresses (not that I've ever owned one). Their dresses are absolutely gorgeous. First I have to say, those Goofballs look delish! Thanks so much for hosting this giveaway, they have some adorable dresses! In my neck of the woods it's pretty chilly so winter coats and boots are pretty much the fashion right now...and I love it, lol! AND liked the Shabby Apple page on Facebook! Thanks again! I'm in the south so frilly springtime and Easter dresses are always a fav! I like you on facebook as Jessica F! I like Shabby Apple on facebook as Jessica F! Unfortunately, I can't enter because I'm Canadian -- but good luck to the rest! I love all the floral prints for Spring that are out there now. I'm in your camp. My idea of style is the $5 clearance sale on jeans at the local target (I've been known to buy three pairs at a go when they hit that price). I could definitely stand to up my fashion level a bit. Thanks for the opportunity! Love that dress! I don't know what would be considered trendy here... except for maybe breaking out flipflops because it doesn't feel at all like February? I like you on Facebook via Cindy A.
I like Shabby Apple on Facebook via Cindy A.
I live in a college town and so I see a lot of the hippie chic fashion. Its awesome and I wish i could pull it off! I'm gonna try these goofballs...I love larabars so I will REALLY love the extras that your goofballs have like the coconut and rice krispies! Yum! Like Shabby Apple on FB, too. The fashion trend in my area of the world is pretty much the same year round since we're coastal; shorts, flip flops or UGG's and a tank or bikini top... but not for me being over 40! Fashion Trends... can I say I don't know? I'm about as fashionable as a paper bag! How about comfortable? That's always fashionable, right? At least for me! great giveaway!! great snack for the kiddos!! I bought a couple of Shabby Apple dresses after the last giveaway you did with them. Gorgeous stuff! Such a pity I am not eligible. The goofballs also look good. Not gonna lie..I am absolutely the opposite of stylish also. But I LOVE shabby apple products! So perrtttyy. These date balls look addictive. SO moist and pop-in-your-mouth-able! 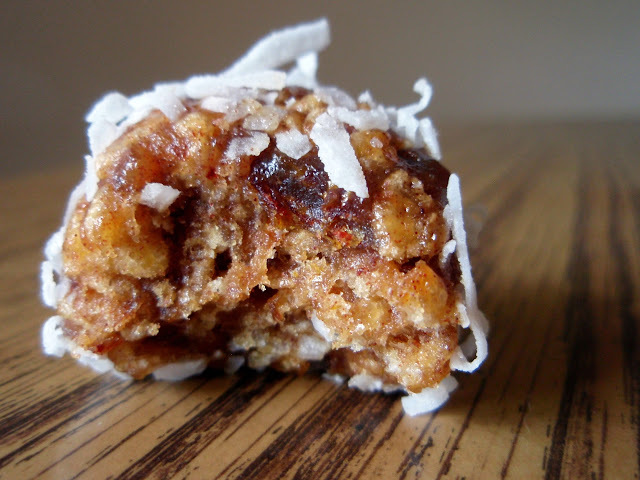 These look so scrumptious with dates, I like the rice crispies in these too! 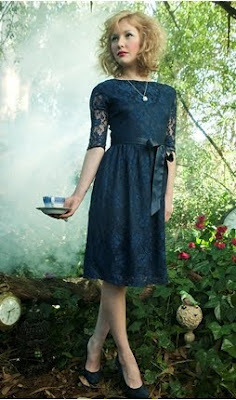 I love the Tanglewood dress! Girls still wearing cowboy boots here! Hmm fashion trends here include: skinny jeans with boots and scarves. Layers is still the favorite fashion trend in my part of the world! Also, I like Shabby Apple! Fun goof balls and an adorable dress, Grace. Fashion trends in Florida? Hmmmm. Always jeans. Una exquisitéz elegante y tentadora,abrazos hugs,hugs. I want to eat some goofballs NOW. Also, I realise I can't enter, but i now want about 6 dresses. I particularly like 'Alice', 'The Red Queen', and the pinstripe flared one in the 1943 collection. I am going to have to find out if the do international shipping! The only fashion trend happening in a college town are uggs and sweat shirts nothing too exciting here. I like you on Facebook~! I like Shabby Apple on Facebook. BTW your link to Facebook for the company does not work. Love the name of these adorable treats! I still feel like I can't get away from (other people wearing) skinny jeans. Also, here, the biggest fashiony thing is riding a bike. Which makes me mostly unfashionable, except for once in awhile on the weekend! Such a pretty dress!!!! Latest trend here??? Hmmm I'm not very trendy but the hubs + I have been loving flannel. It's totally coming back right?? Well, if Shabby Apple can me look that thin and tall, I will buy a dozen dresses! I doubt you deliver to Canada, but in the off chance you do, count me in. Love the goofballs and the dress! Love Shabby apple too. I already like your FB page!! So interesting the goofball, dates, crispy rice and coconut...sounds indeed very tasty. 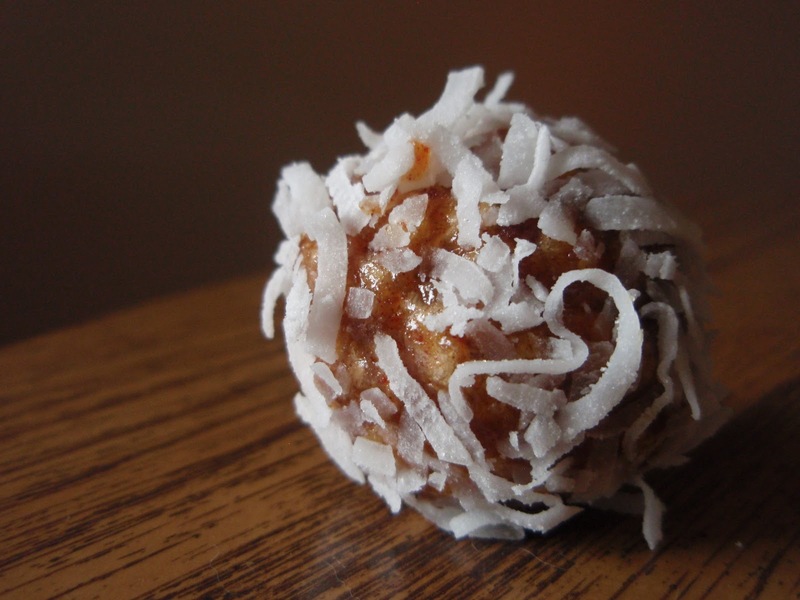 My mom makes a very similar cookie ball, but she rolls hers in powdered sugar rather than coconut. And, they're some of my favorites! I have to try them with coconut. Regarding fashion trends in my area. February is almost over which means summer is pretty much here. Tank tops and flip flops are probably more of a necessity than a trend, but that's what I see. It's been cold so usually jeans but a girl could always use a dress. Those little goofballs would be a big hit here in my home. I am so out of touch with fashion...this would definitely be a step in the right direction! Those goofballs look fantastic. As for fashion I'm always the last to know. Winter boots are on the way out but I not sure what's on the way in. Aww Grace! I love the dress you picked out! It's very cute. I picked out a dress from their site, but have yet to wear it. I haven't gone anywhere fancy enough! Seeing as the weather here has been incredibly unpredictable (from freezing to 70 degrees in a single day, numerous times a week), we're all layering like cakes here to keep our bases covered. (Mmm, layer cakes.) Thanks for the giveaway! Also, I liked your page on Facebook! Lastly, I shared the FB-love to Shabby Apple, too.